Carte du Perou et du Haut Perou. 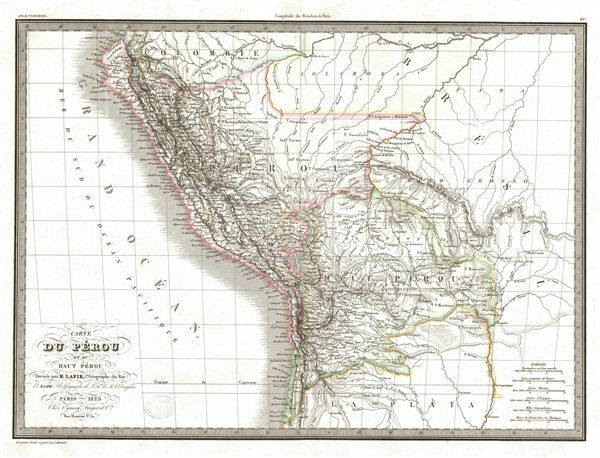 A fine first edition example of M. Lapie's 1829 map of Peru, ecuador, and Bolivia. The map shows all of Peru and Upper Peru (modern day Bolivia) from the Pacific Ocean to Brazil and from Colombia to Argentina (La Plata) and Chile. During this time in history, Upper Peru, as with much of South America, was in the midst a struggle for independence from Spain. Conflicts began in 1809 and lasted 16 years before it was established as a republic and named ‘Republic of Bolivar' in honor of Simón Bolívar, a leader in the Latin American Wars of Independence. Around the same time, in 1821, Peru was proclaimed independent. Antonio Jose de Sucre, a Venezuelan independence leader and one of Simón Bolívar's closest friends, was given an option of either unite with the United Provinces of Rio de la Plata, stay under the newly formed Republic of Peru, or create and new nation. He chose the latter. This map was engraved by Armand Joseph Lallemand as plate no. 49 in the first edition of M. Lapie's important Atlas Universel. This map, like all maps from the Atlas Universel features an embossed stamp from the Lapie firm. Rumsey 2174.049. Phillips (Atlases) 754, 765.